After the Hollywood Sign and palm trees, traffic is probably the city of Los Angeles’s most recognizable feature. The city has long been infamous for gridlock; so much so that it embarked on an aggressive and expansive project in 1999 to improve traffic conditions with wider avenues, more lanes, and upgraded freeways. Now, less than two decades later and with road congestion worse than ever, Mayor Garcetti and the LA City Council have approved a bold new plan to tackle the issue with methods that may come as a shock to some. Officials want to decrease the number of lanes, and even slow traffic in some cases, in one of the most sweeping and comprehensive transportation policy shifts the city has ever seen. On Tuesday, the city approved Mobility Plan 2035 with an overwhelming majority. The plan calls for the creation of hundreds of miles of bus lanes, bike lanes, expanded sidewalks, and improved mass transit hubs. These changes will often come at the expense of road real estate as many major avenues and boulevards will have their drivable lanes reduced. The end goal of this twenty year operation is threefold: increase walkability, encourage alternate forms of transportation, and decrease pedestrian fatalities. The 2035 plan is a stark contrast to the 1999 plan set in action a mere sixteen years ago. Los Angeles wants to become a modern, multimodal city. It’s a brave plan that research indicates may revolutionize the way people get around for the better. At the turn of the millennium, the main objective of the Los Angeles Department of Transportation was simply to keep traffic flowing, and to keep it moving as quickly as possible. Roads were widened and freeways were expanded; often sacrificing trees, hillsides, and even homes in the process. LA’s roads were already bursting at the seams. Building more roads, and building them bigger, seemed to be the sensible solution. In a city as sprawled out as Los Angeles, better mass transit proved to be an allusive endeavor. In 2015, the city finds itself virtually back where it started, only with half a million more residents and commute times roughly the same or worse than they were in 1999 to show for it. The road expansions didn’t do the trick because, as engineers have come to understand in recent years, you simply cannot build your way out of congestion. Fascinatingly—and seemingly paradoxically—more roads equals more drivers. Economists Matthew Turner and Gilles Duranton famously determined this while comparing the number of roads built to miles driven in US cities between 1980 and 2000. “We found that there’s this perfect one-to-one relationship,” said Turner while discussing his findings. If a city increased its road capacity 10% so too did the amount of drivers on the road, a reality that Los Angeles knows only all too well. If LA would have a chance of escaping its notorious gridlock, it would need to do things differently. In addition to a new network of bike only lanes throughout the city making cycling safer and more practical, Mobility Plan 2035 also calls for 240 miles of bus-only lanes on major corridors like Sherman Way and Venice. Buses will operate more frequently with streamlined routes. Rail lines will continue to be extended. Sidewalks will be improved and widened. The city’s researchers found that 47% of all trips in Los Angeles are within walking or biking distance, yet 84% of these trips are made by car. 75.2 million miles are driven every single day in LA. Meanwhile 10,750 miles of sidewalk, over 42% in the city, are in disrepair. At the same time, 87% of the roads in LA are relatively flat, and the city experiences over 300 days of sunny, warm weather per year. A huge percentage of Angelinos drive simply because they believe they have to. But city researchers are asking the question: what if they didn’t need to? Mobility 2035 wants to get drivers off the road by showing them practical alternatives. It aims to cut 1.7 million miles of personal car usage by 2035. Under the plan, projections are set to increase walking by 38%, mass transit 56%, and biking 170% within the same timeframe. Easing congestion isn’t the only goal of Mobility. The mayor’s office is also looking to address what it views as an unacceptable rate of pedestrian deaths associated with traffic accidents. 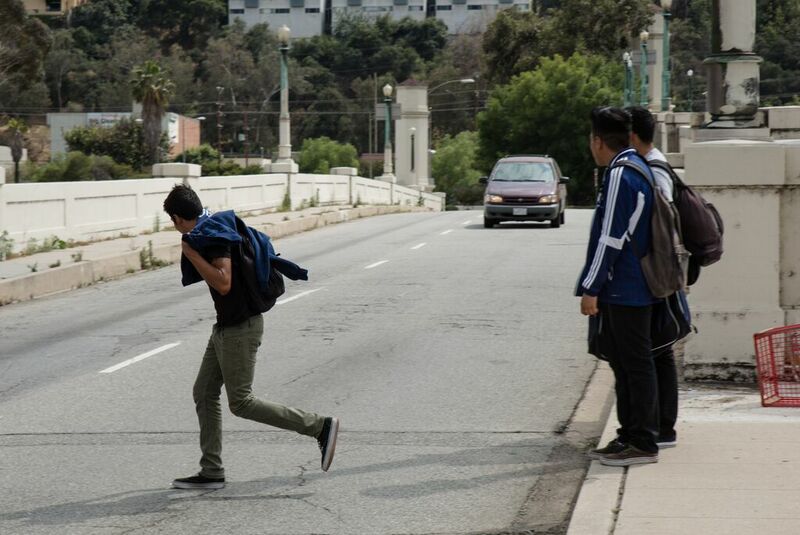 Only 1 out of every 10 car crashes involve pedestrians in Los Angeles, yet pedestrians make up 35% of all traffic fatalities in the city. LA has a pedestrian fatality rate for children 4 and under as well as adults 70 and over that is more than twice the national average. By making roads more friendly for foot traffic, the city hopes to not only get more people walking, but to also tackle what councilmen Mike Bonin calls its “legacy of shame”. Mobility 2035 aims to bring the pedestrian fatality rate down to 0. For all of its lofty objectives, Mobility isn’t without its detractors. Some neighborhood leaders and councilmen oppose removing car lanes in the fear that it will make areas that are already congested even more gridlocked. Officials are quick to point out that this won’t necessarily be the case, and that slower moving traffic isn’t the same thing as congestion. “Slower traffic can actually in some ways accommodate more cars moving through an area,” Notes city planner Claire Bowin. This is also good for business. Areas of the city that have already renovated roads to be more walker and biker friendly have seen profits. “Small businesses are improving because now people are slowing down and saying, ‘Hey I didn’t know there was a pie shop there,’” says Councilman Jose Huizar. The city doesn’t deny that the transition away from prioritizing personal vehicles won’t be easy, but stresses that it’s a necessary one to make and for a better future. For proof, visit the Sunset Triangle Plaza in Silverlake. The first of LA’s “street to plaza” conversions was little more than an intersection before 2012. With Garcetti’s support, then a councilman and still a candidate for mayor, the junction at Sunset Boulevard and Griffith Park Boulevard was transformed into a pedestrian park. Planters were set up as roadblocks to close off car traffic, the street was painted with green polka dots, and tables and chairs with umbrella shade structures were installed. The project was a pilot program. A one year experiment to determine if creating such a space would prove popular or cause traffic issues. Within a year’s time, the pilot program would have to be renewed to determine if the plaza would remain in place, or if it would revert back to the original intersection. Today a resounding success, Sunset Triangle Plaza attracts crowds every other Thursday when a free movie is screened on a portable projector screen, and scores of customers during its weekend farmers market. It’s also a popular destination local destination just to hang out. A Los Angeles that moves away from its strong car culture may seem bizarre, but it’s a process that was most likely inevitable; even without Mobility 2035. The figures reveal that it was already happening. In LA, 64,000 people already walk to work. 16,000 people bike, a number that has increased 56% from 2000 to 2010. The LA Metro system is the 3rd most used in the nation and sees 1.5 million riders daily. Its relatively young Metro Rail saw 348,158 daily riders as of December 2014 which is a 12% increase over the previous year. In the past decade, despite a steadily increasing population, car ownership actually dropped about a percent, and Los Angeles isn’t alone. The trend is a national. Car ownership peaked in 2005 and is now in decline. It’s not limited to major cities like Boston and New York which already have expansive mass transit systems (56% of NYC households are car free). Even smaller cities like Oklahoma City and Milwaukee went down in car ownership by 7.2 and 1.5 percent respectively between 2007 and 2012. In fact, out of the top 30 most populous cities, 21 cities listed saw a decrease of car ownership within that time. The Great Recession is partly to blame, but researchers believe the root causes are more complex. There aren’t just a smaller number of people who own vehicles. Those who do are driving less. A major reason for this is the decline of the suburb, and the reemergence of the city center. People are less likely today to live a considerable distance from where they work; young people in particular. Millennials are the least likely age group to purchase personal vehicles. Between 2001 and 2009, drivers in this age group decreased 23% and continue to fall. There’s also been a significant drop in 16-39 years olds even getting licences in the first place. The culture is changing, something researcher Michael Sivak and the University of Michigan’s Transportation and Research Institute have duly noted. “When I was in my 20s and 30s I was curious about what kind of car people drove, but young people don’t really care. A car is just a means of getting from A to B,” Mr. Sivak observes. The culture of automobility appears to be dying off. Replacing it is a migration back to urban areas and commutes that utilize mass transit, biking, and ridesharing apps. Whether or not we’re truly moving toward an era of the post person automobile, one fact is for certain. With urban populations on the rise and showing no signs of slowing, the current way of doing things simply isn’t sustainable. For Los Angeles, dethroning king car isn’t a bold choice toward a better lifestyle. It’s a matter of survival. 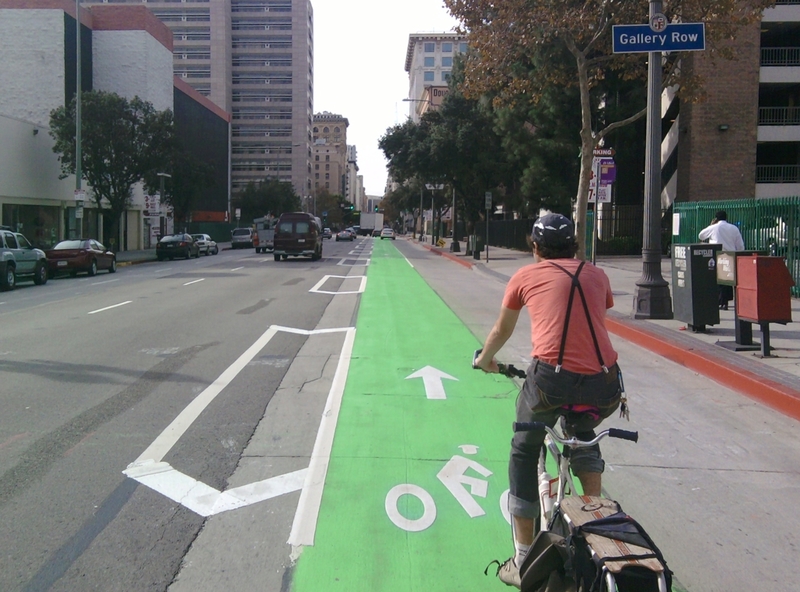 This entry was posted in Sustainable Urban Renewal, Urban Landscape, US Cities and tagged bicycling, bike lanes, featured, green development, los angeles, mobility plan 2035, safety, sustainability, traffic, walkability. Bookmark the permalink.